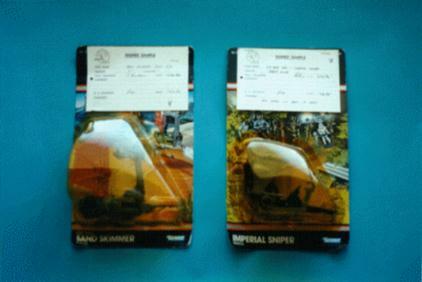 These are two production samples for the POTF minirigs, One Man Sand Skimmer and Imperial Sniper. There is a card stapled on the front for comments and sign-off in the quality assurance process. The top of the cards read: SIGNED SAMPLE. Once the packaging is signed off, the product can be issued to market. The toys themselves are the same as the production pieces.